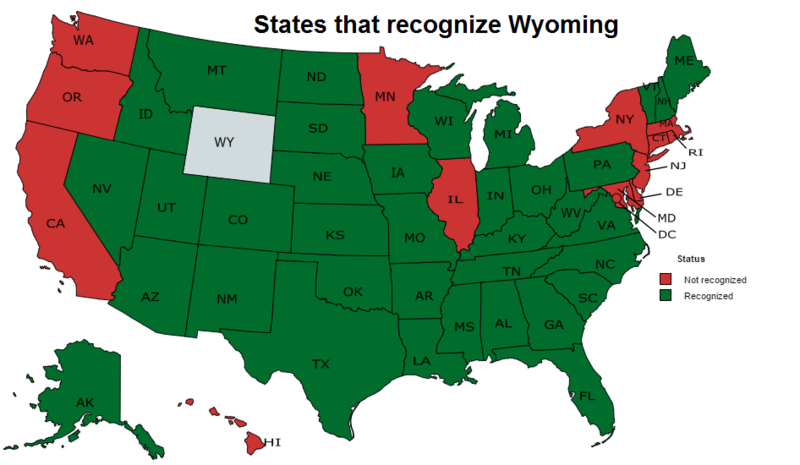 Wyoming does not have any form of pistol/firearm licensing, gun registration, an assault weapons ban or magazine restrictions. There is no waiting period mandated for firearm purchases and private gun sales are legal. Concealed firearm permits are shall-issue and Wyoming residents do not need a permit to conceal a firearm. Open carry is legal, does not require a permit, and is less regulated than concealed carry is. You may not take a firearm (openly or concealed) into a jail, a state penal institution, the Wyoming boys' school, Wyoming girls' school, or a private correctional facility, the state hospital, or a courtroom. Judges may carry a concealed firearm in their courtroom and may grant others permission to carry a concealed weapon in their courtroom. Any place where the carrying of firearms is prohibited by federal law or regulation or state law. This does not apply to open carry. Wyoming has no other laws prohibiting where firearms cannot be openly carried, including schools, and colleges. Open carry is not regulated except at the state capitol, courts, mental health and correctional institutions. Schools, universities, and government employers may regulate their employees and students behavior under threat of discipline or termination/expulsion. K-12 students may be expelled for bringing a firearm onto campus, 21-4-305(a). College/university students should check their campus's policies or student code. There is no law prohibiting open carry by parents/adults at a school or by non-students on a college/university campus. Use caution, however, as you may be harassed by staff and law enforcement. This is a federal law that is not enforced by Wyoming law enforcement and there is no applicable similar Wyoming law (unlike some states). You generally will not be prosecuted unless you are doing something else illegal, such as involved in gang activity or drug violations, that interest federal law enforcement. The law was intended to apply to drug dealers and gang members, not the law abiding citizen. Can I carry in a bar? Can I drink while armed? You may not carry a loaded firearm ("with a cartridge therein") or hunt while intoxicated or under the influence of a controlled substance, 23-3-307 (a hunting regulation, but nonetheless applicable). You can openly carry a firearm in a bar or restaurant, though concealed firearms are more strictly regulated. 6-8-104(t)(vii)​ prohibits concealed carry only in "any portion of an establishment licensed to dispense alcoholic liquor and malt beverages for consumption on the premises, which portion of the establishment is primarily devoted to that purpose." This would define bars and bar areas of restaurants, but not the main dining areas of restaurants. Concealed carry is prohibited in a vehicle (no distinction is made by the law), but open carry and loaded rifles/shotguns is not regulated. There also is no exemption for home or business concealed carry. Generally, a homeowner, private property owner, or businessman is not interfered with for open carry. Do 'no guns' signs have the force of law? This section would have to be liberally applied to allow a sign banning a particular behavior, carrying a firearm, to constitute trespassing. Common understanding of the law in Wyoming a 'no guns' sign is a request and a verbal warning by security or the property owner/management is the warning that must be heeded to avoid a violation. A guest or patron of a public business is not an intruder. Frontier Carry is not aware of any case law or legislative intent regarding firearms and this section. Under federal law (local laws may differ), firearms are prohibited beyond the TSA checkpoints. You also cannot attempt to enter a TSA checkpoint while armed, even by mistake. ​Check your bags! Even loose ammunition, empty magazines, spent cases, and miscellaneous gun parts have caused problems and prosecutions for travelers. Learn more about the TSA regulations. National Forest and Bureau of Land Management (BLM) lands in Wyoming have no ban on the carry of firearms. Anyone convicted of committing or attempting commit a violent felony is a prohibited person under state law, 6-8-102. A person who knowingly possesses [... or] transports [...] a deadly weapon with intent to unlawfully threaten the life or physical well-being of another or to commit assault or inflict bodily injury on another is guilty of a felony. All statutes (WS) Wyoming Statutes unless otherwise indicated.